Is it possible to have global color swatches or color styles in Photoshop? I'm looking for a way to use one color in multiple different layers, and then be able to change that color in all the layers in one single place. Lets say that I have four layers using #ffffff. Now I want to know what my design looks like with #ffff00 instead. How can I do this without manually changing all four layers? I can add that adjustment layer on hue/saturation is not really what I'm looking for. What I need is something like "change all #ffffff to #ffff00." There's a few good ways to tag, filter and apply changes across your entire document. It's not the same as global colour swatches or CSS-like styles, but it's still very workable and fast. Tag your layers in a way that will allow you to filter them later. I've done this with layer colours below, but you could easily add tags to layer names or use some other method. It doesn't really matter how you do it, as long as you do things in a way that are filter-able at a later time. Now you can filter your entire document to only show layers with a certain tag. If you've changed one of the shape layers to the new colour, you'll now be able to right click and Copy Shape Attributes, then select the other layers and Paste Shape Attributes. If your layers are bitmap layers, or you'd like to apply your colours and gradients, you can do so using layer styles (layer styles can be copied and pasted as well). 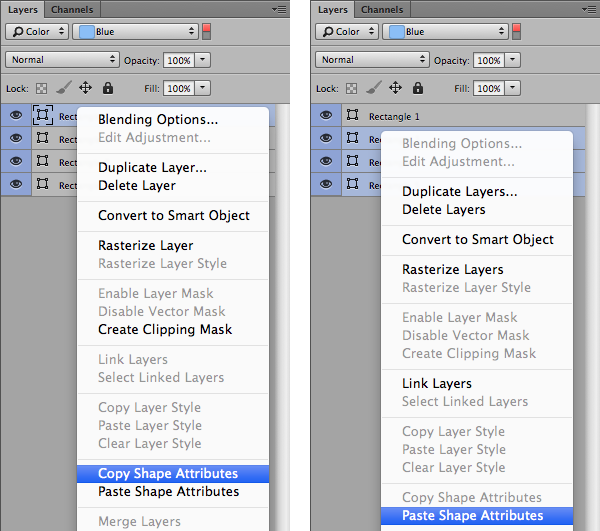 Please note that layer filtering is a Photoshop CS6 feature, and not available in earlier versions of Photoshop. apply a Color Overlay Layer Stye to the group. 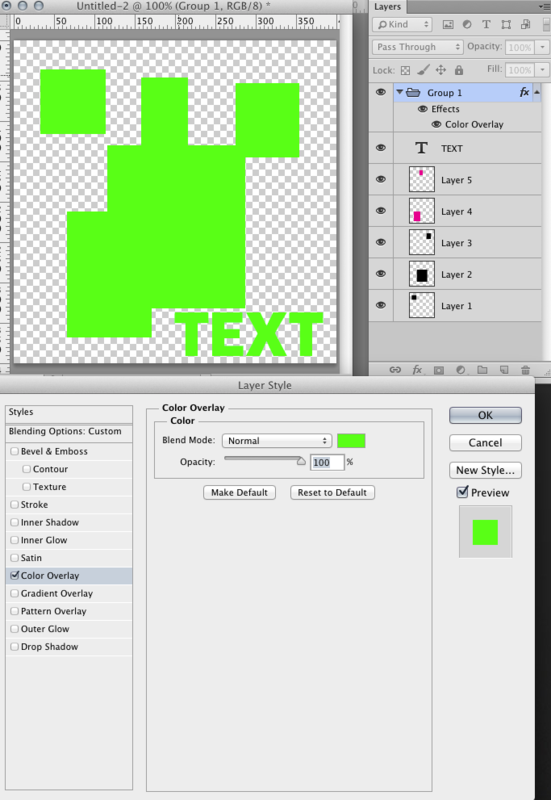 You can then double-click the Layer Style and change the Color Overlay color. This may not work for every instance, but it can be exceptionally handy in many cases. I'd be happy to be wrong here and have my answer superseded, but I don't believe that it's possible. It is in InDesign, but since Photoshop treats colors and objects differently, I don't think it works. Someone over on Photoshop.com asked a question that I believe is the same thing you're asking, and the response was to use "Replace Color." That works for one layer, but not all layers. Photoshop does not support "global" swatches in the same way as Illustrator or InDesign (InD swatches are always global). 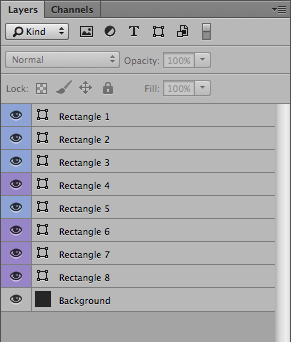 The swatches functionality in Photoshop is just a source to grab colors from. It makes no effort to manage those swatches in a usable way. One more bit of evidence that Photoshop is not the right place to do your design work. There may be a way via scripting, though I'm not familiar with one. This script addresses solid color layers. That problem is more straightforward. It's a long shot but I would post the question at the Adobe scripting forum and see what you get. If anyone knows it's that group. I place a Solid Colored layer into a smart layer. Then I apply copies of this smart layer as a clipping mask to all of the shapes and other objects that should be the same color. If I want to change the color, I just updated the original smart layer. Unfortunately, I don't think this clipping mask solution works with layers within other smart objects. Opt + Delete (Backspace on Windows) = fills the layer with foreground color. Not the answer you're looking for? Browse other questions tagged adobe-photoshop swatches or ask your own question. Is there a Photoshop (CS5) plugin that will make color swatches global? How to associate a color with multiple images in Photoshop? Change PSD's color with variables? Photoshop: how to change the saturation retaining hue and brightness?